Dr, Stephan Scott spent 8 months worth of weekends building PAULYNE, and Harry Bryan Daisy design. 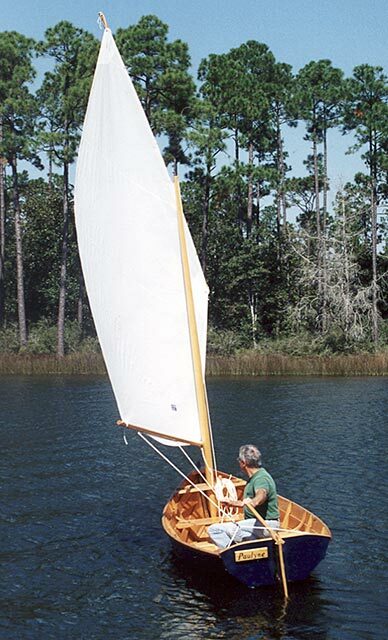 PAULYNE is a 12'6" dory/skiff with a beam of 4'2". He launched PAULYNE on May 31, 2003. Stephan plans to use her in Pirates Cove, Alabama and on Arnica Bay located on the ICW. Stephan took his first WB class in 1996 - Warren Barker's Introduction to Boatbuilding. 1998 Stephan took a second class, this one taught by Harry Bryan, which was on building this particular design. Stephan returned to WB school for a third summer in 1999 to take Jerry Burley's Joinery class. You can reach Stephan at 6541 County Road 95, Elberta, AL 36530 or at shscott2000@yahoo.com.